At this time of the year, there's generally a bit of a lull in terms of the quality of new films coming out in the UK. With the Oscars having been and gone, the Hollywood studios are now saving their more prestigious releases for next winter, and blockbuster season won't start again until Easter. Looking at what's opening over for the next few weeks, the likes of John Carter, We Bought A Zoo and Bel Ami don't exactly set my pulse racing. It's not all bad news though - even if Hollywood is using this time of year as a bit of a dumping ground, there are still plenty of interesting arthouse/ foreign films due for a UK release in the new future. In Darkness and The Kid With A Bike both look promising, and I'm eagerly anticipating Once Upon a Time in Anatolia. Those movies should keep me busy until the release of the Avengers movie (which has apparently now been given the rather unwieldy name 'Marvel Avengers Assemble', in case anyone confuses it with the notorious '90s flop starring Uma Thurman and Sean Connery). I find it's often much easier for me to write a review of a film which I've really loved or hated than something which I am ambivalent towards. While I can list the brilliant performances or excellent cinematography of a cinematic masterpiece, or laugh about the flaws of an embarrassing turkey, when a film is just mediocre (like Stake Land), it's hard to know what to say. Anyway, I'll try and do this one justice - it's a tale set in a dystopian future where a plague of vampires have sucked the blood out of vast swathes of the United States. We follow a tough, crude vampire hunter known as 'Mister' (Nick Damici) and his teenage companion, Martin (Connor Paolo) as they journey north through their devastated country in search of salvation in Canada. The undead aren't the only problem for our heroes - they also have to contend with a powerful and growing doomsday cult which has taken the coming of the vampires as a sign that they should seize control of the country and prepare for the apocalypse. The vampires on display in Stake Land are a million miles away from the suave, seductive Count Dracula - they are stupid, bloodthirsty, brutish creatures who have more in common with the fast moving zombies in 28 Days Later. As I've mentioned above, this film is just OK - there's nothing particularly wrong with it, but when held up against a really well made picture like The Road (which has a similarly themed plot, minus the vampires), the script, acting and production values all suffer in comparison. Though there a few impressive set pieces (such as the opening assault on Martin's family and a tense stand-off with a horde of vampires in a car park), I was never completely absorbed by this movie or invested in the fate of the lead characters. Way back in the mid '80s, Steven Spielberg was known as a brilliant commercial director, having been responsible for massively successful blockbusters like Jaws, Raiders of the Lost Ark and E.T. - but to date, an Academy Award for directing had eluded him. With The Color Purple, Spielberg couldn't have made a more transparent grab for a statuette than if he'd just shot himself bellowing "I want an Oscar" for two hours and posted it off to the Academy. 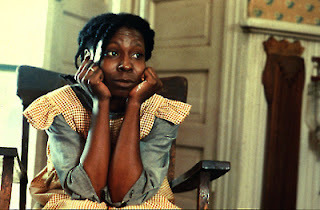 Pretty much every element is in place for Oscar recognition here - it's the story of the life of Celie, a young black woman living in rural Georgia at the beginning of the twentieth century. Though she is poor and has to put up with raising the difficult family of her abusive and cruel husband, her budding friendship with Shug Avery, a free spirited singer, allows her to dream of better things... Sadly for Senor Spielbergo's union regulated American equivalent, it didn't come off this time, and though the film was nominated in a number of categories, it went home empty handed. Why? Well, for me, this film suffers from being overly sentimental, and, more seriously, at times it seems to shy away from delving too deeply into the misery and suffering that African American women of this period in history must have suffered. Spielberg is instead content to focus on the positive - their indomitable spirit, the simple pleasures of country life - that kind of thing. The musical score is overused and heavy handed, deployed in an attempt to prompt the viewer to burst into tears at frequent intervals throughout the film. In terms of the way the film finishes, it reminded me a little of Wayne's World - only rather than trying out the Sad Ending and the Scooby Doo Ending, Spielberg decided that only the Mega Happy Ending was do-able - and stuck with it. I don't want to sound too harsh - despite what I've said above, I am a Spielberg fan, and the film does have quite a bit going for it. There are very good performances from Whoopi Goldberg and Margaret Avery, the film is (as ever with Spielberg) beautifully shot and there are some brilliantly directed sequences - particularly those set in the juke joint, where the whole community turns up so see Shug Avery sing. Fortunately for me (and the movie going world in general), Spielberg moved on to direct a series of films which managed to be both moving and exciting without lapsing into excessive sentimentality - and he was justly awarded the Academy Award for best director for Schindler's List and Saving Private Ryan. Sadly, he seems to have relapsed somewhat with War Horse (http://kvhmovieblog.blogspot.com/2012/01/that-was-week-that-was-16-22-january.html), which had a number of similar failings to The Color Purple. Here's to hoping that Mr Spielberg will return to top form with next year's Lincoln. Whatever happened to Kevin Costner? Back in the 1980s and early '90s, he was pretty much King of Hollywood, but his stock has fallen so far of late that I've heard rumours that his most recent role is working as a deck chair collector on Yarmouth Pleasure Beach (note: these rumours may have be made up by me). 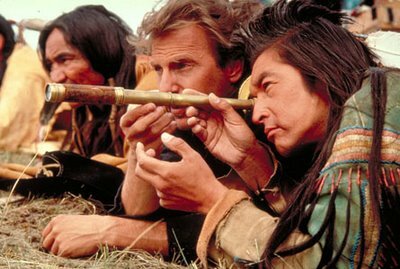 Anyway, in terms of awards, Dances With Wolves is one of Costner's greatest successes, winning him Best Picture and Best Director whilst also bagging him a nomination for Best Actor. After twenty odd years, does the film stand up? Well, for me, it's a solid picture, and a fine example of a modern day revisionist Western, in which the Indians are the heroes of the piece and the white settlers are wasteful, arrogant fools, taking land away from its rightful owners. 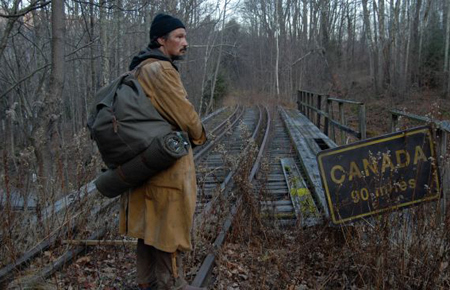 The plot sees Costner as world weary civil war hero John Dunbar, who requests a post on the outer reaches of the American Frontier in an effort to find some peace and quiet. Whilst there, he encounters a tribe of Sioux Indians, and he gradually earns their respect until he is able to live amongst them as an equal. On the plus side, we get some beautifully shot footage of the American prairie, a breathtaking scene in which the Sioux hunt a herd of buffalo and an interesting romantic subplot in which Kevin falls in love with a white woman who has been adopted by the tribe as one of their own. On the negative side, at three hours long, the film feels a little bloated, and some judicious editing could have improved matters. Though it isn't really a big problem here, a failure to keep his films to a reasonable running time was one of the reasons why Costner's follow up films Waterworld and The Postman were such notorious flops. Anyway, if I see Kev collecting chairs on the Pleasure Beach, I'll let him know I liked this one. My favourite movie of the week stars Elizabeth Olsen as a young woman who has recently escaped from a Manson family style cult, and is hiding out with her sister and brother-in-law in their handsome lakeside property in upstate New York. Though her given name is Martha, she is rechristened Marcy May by her new 'friends' in the cult, and just as her identity is split between these two names, the film reflects her fractured state of mind. Flashbacks showing her indoctrination into the ways of the cult are interwoven with scenes depicting her struggles to reintegrate into normal life - and her paranoia that the remaining members of the cult are going to track her down. Two performances in the film are particularly praiseworthy: Elizabeth Olsen is fantastic in her first screen role, brilliantly portraying a young woman just barely managing to keep it together. John Hawkes is also exceptional as the leader of the cult - a superficially charismatic and charming individual who is able to manipulate those around him to his own nefarious ends. Above all, director Sean Durkin deserves a great deal of credit for the disorienting effect that the film has on the viewer - you're never quite sure whether what you're seeing is real, or just a paranoid delusion on the part of Martha. Though the ending to the film is rather abrupt and a little confusing, I didn't feel cheated by this - it's ambiguous for a reason. The way in which you interpret it depends on whether or not you believe in the things that Martha sees. 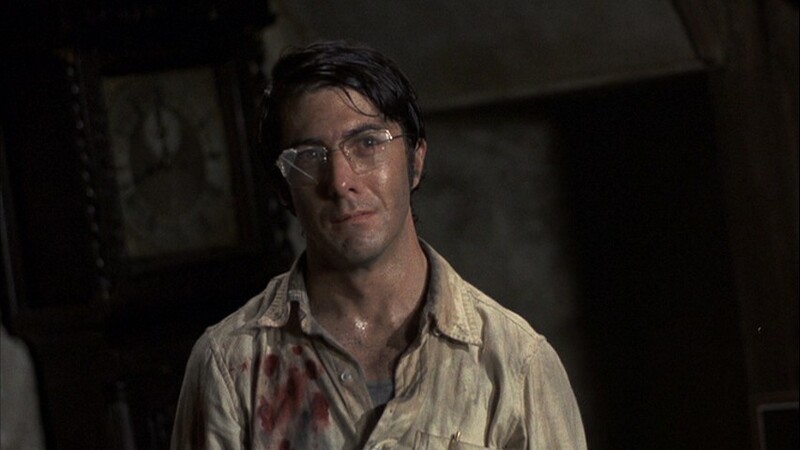 Sam Peckinpah's famous and controversial movie sees Dustin Hoffman star as David Sumner, a bookish American professor of mathematics who decides to leave the States behind and spend a little time in the Cornish village in which his beautiful English wife (Susan George) grew up. Of course, if Sumner thinks he's going to get away from turmoil and violence by moving to the English countryside, he's in for a surprise. From the outset, it is apparent that something is not right within the village, and what begins as taunts and jokes from the locals to the outsider in their midst becomes a campaign of intimidation. Finally, even the mild mannered Sumner is forced to resort to violence to defend his home and his family... This is a film which begins a little slowly, but the tension builds and builds until it explodes in an astonishing and powerful ending. It's also notable for a wonderfully edited sequence set at a church gathering, in which the innocent images and sounds of a party are brilliantly intercut with the shocking actions of the night before. It seems that Peckinpah's (rather cynical) theme here is that beneath a veneer of civilisation, human beings are brutish, violent creatures. Though you may be able to hide your animalistic side for a time, ultimately even the most refined person cannot help but resort to their baser instincts. I'm not sure I entirely buy into this theory myself - but the film is a landmark of '70s cinema and well worth a look all the same.